Luscious, simple, classic: tender and moist caramel cake is iced with browned butter frosting, which is nutty, a wee bit salty, and sweet. Candied almonds add festive notes to offset the simple aesthetic of the cake. I’ve made this cake many times before. 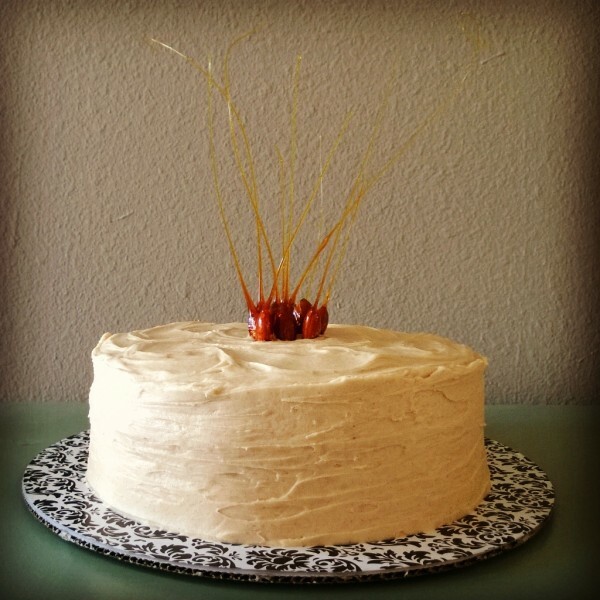 It’s a really good one: Caramel Cake with Browned Butter Frosting. The cake is fairly traditional in the South and is the kind of thing that I suspect is something of a standard in your family if you are the right age and from the right part of the country. However, growing up on the West coast, it seems to not be that common. So I’ve never watched as a family member made this cake; I never got the full tutorial on the best way to make a caramelized sugar syrup and as a result, every time I make this cake, I find I have to make multiple attempts before I get the syrup right. If you’re too hasty, you can burn the syrup and fill the kitchen with a nasty, acrid, sweet smoke. 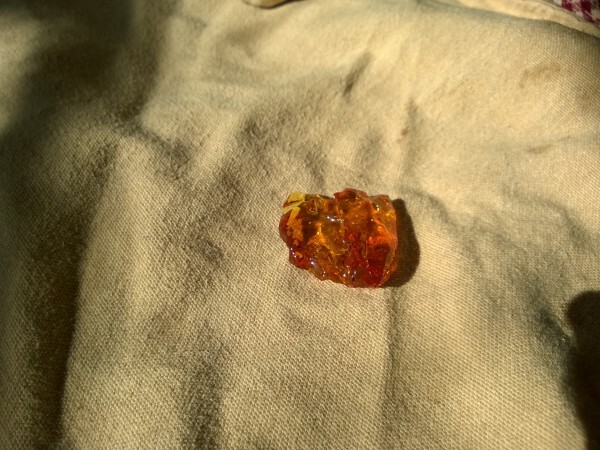 If you’re too slow, you won’t get the sugar to caramelize until you’ve hit the hard ball stage of sugar and end up with a truly lovely and wholly unusable glassine candy that is a complete pain to get out of your cookware and anything it touched. Making this syrup takes patience and assertiveness and just the right technique, which I finally worked out today, on the third try no less, and which is completely the opposite of what the recipe instructs. Past the hard ball stage, the sugar cools to a hardened, shining jewel that’s as lovely as it is completely useless. While it would be a lot easier to just skip the syrup and let the browned butter frosting justifiably take the center stage alone, it would also be such a shame. The syrup is what makes a regular cake into a caramel cake and the way the caramel cake harmonizes with the browned butter frosting is true music for the senses, so it’s worth working it out. I think perhaps because I am a writer, or maybe because it’s just my weird mind, I see metaphors everywhere. I mean everywhere. Which is why I think I’m always connecting people with their cakes. So of course as I was struggling with the sugar syrup, thinking I had it on the first try, then thinking I’d get it on the second try, and finally using a completely different approach on the third try, I couldn’t help but think of Dee, ever friendly and warm, for whom I am making this cake as he celebrates his 78th birthday, and his beautiful wife Ruby, who is the epitome of class. I have had the pleasure of living next door to Ruby and Dee for almost 9 years now and they are truly two people who seem to know how to do it right. Though retired, they have continued their education and both become master gardeners, something to which their beautiful yard and garden can attest. They travel to incredible places all around the world on a regular basis. They visit friends, travel with friends, and host friends. They spend time with their children and their families, get one-on-one time with their grandkids, they walk their sweet dog Zoe every day, they work outside, they smile, they laugh, they engage. Simple browned butter frosting is set off by candied almonds. But what impresses me most about Ruby and Dee is that when they are together, they seem to sincerely enjoy being together. They smile when they look at each other, smile when the other is talking and don’t interrupt, and they speak to each other with an intrinsic kindness in their voice. As someone who has likely not yet been married even half as long, I see them as true role models. It’s no small thing to have shared your journey with someone for so long and still be happy to be traveling with them. And as I was struggling with the sugar syrup today, that’s what I was thinking about. That a successful marriage is not easy. The multitude of marriage books, seminars, counselors, and TV shows all promise their own unique way to fix a marriage, but when it comes down to it, I suspect it’s really not as complicated as the multi-million dollar industry would want you to believe. 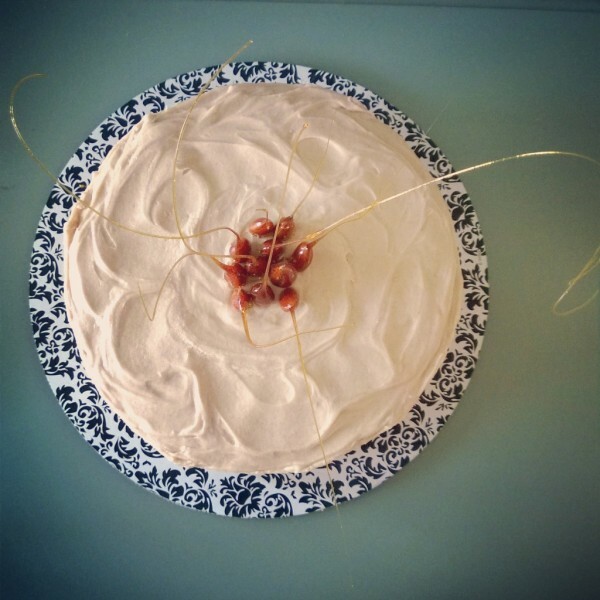 Candied almonds with long, arcing tendrils grace the top of the simple frosted cake. I suspect it’s two simple ingredients: sugar and water, me and you. And it’s melting those two separate ingredients into one new substance. And if you’re too hasty and impatient, forcing your way through, you will burn it and fill your lives with an acrid smoke. And if you’re too slow to react, with problems bubbling and bubbling away like thickening sugar, often you don’t realize you have a problem until it’s glassed over in this shockingly rigid material, shiny and smooth like glass, reflecting back all the inaction that led to this grand problem. A successful marriage often means stepping away from the recipe that seems to work for “everyone else”, consider what you know to be true, and come back for another attempt with your own technique, trusting that regardless of what does or doesn’t work for everyone else, this will work for you, then watching patiently as everything works out as you had hoped. And the simplest lesson of all is that marriage, like this cake recipe, really comes down to the very most basic truth: find a combination that is worth not giving up on and then don’t give up. Keep trying, keep working; if one approach doesn’t work, try the opposite; have patience, be persistent; trust what you know and ignore the “noise” from the world; but above all, find someone you love, someone who loves you, a relationship worth not giving up on, and don’t. give. up. 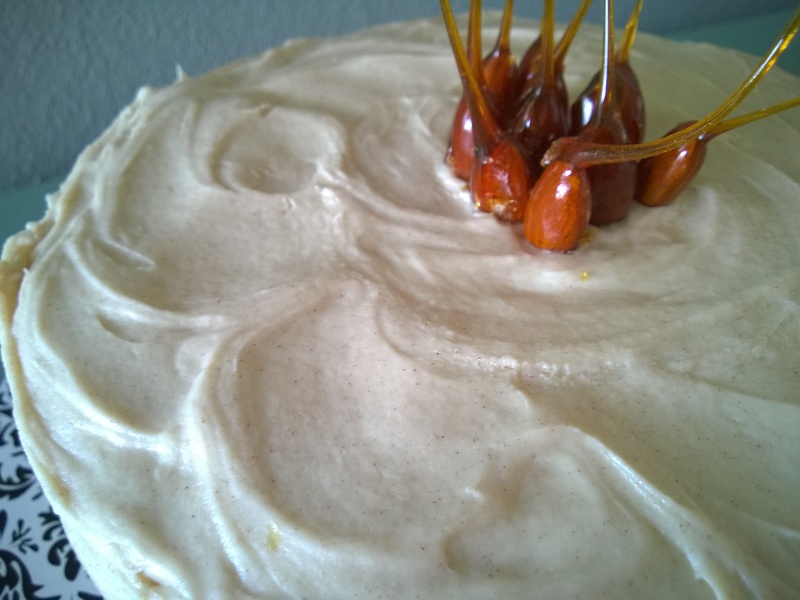 Today’s simple yet delicious cake is a Caramel Cake with Browned Butter Frosting. It is accented by caramelized almonds, an attempt to turn one of the ruined sugar syrups into a beautiful bit of edible art. Happiest of birthdays to Dee and wishes for a wonderful celebration with his beautiful family on this beautiful first day of March.